I wanted to share with you the letter about wildfire that we just sent to California’s new governor, Gavin Newsom. We will be testifying this week at the Capitol about it all. Wish us luck. Encouraged by the spirit of hope that your new administration brings to Sacramento, we urge you to take the lead in creating a new wildfire policy based on science rather than tradition. Why? Because the traditional approach to wildfire protection is backward. It focuses on vegetation rather than what we want to protect – our homes and families. Homes burn because they are flammable and are built on fire-prone landscapes. Most structures ignite during wildfires because of flying embers that can travel a mile or more from the fire front. This is why so many families have lost their homes even though they have complied with defensible space regulations – their homes were still vulnerable to embers. This is why communities far from wildland areas, like Coffey Park in Santa Rosa, have been destroyed during wildfire and why entire neighborhoods have burned to the ground while the trees around them have not (see Fig. 1 below). This is why fuel breaks, twelve-lane highways, and even large bodies of water fail to protect our homes during wind-driven wildfires. However, there is hope. While wildfire is inevitable, the destruction of our communities is not. Jack Cohen, a former lead fire scientist with the U.S. Forest Service, has demonstrated this through decades of research. To stop wildfire disasters in our communities we must accept some basic principles based on science, especially with climate change and increasing numbers of people living next to wildlands. First among them is that the wildfire problem is a home ignition problem, not a wildfire control problem. Focusing on forests and dead trees far from our communities most at risk or habitat clearance projects that have little value during wind-driven fires will only guarantee more of the same – continued catastrophic losses. To stop the destruction of our communities by wildfire we must focus on strategies that will work in our rapidly changing environment: reduce the flammability of existing communities and prevent new ones from being built in very high fire hazard severity zones. Figure 1. 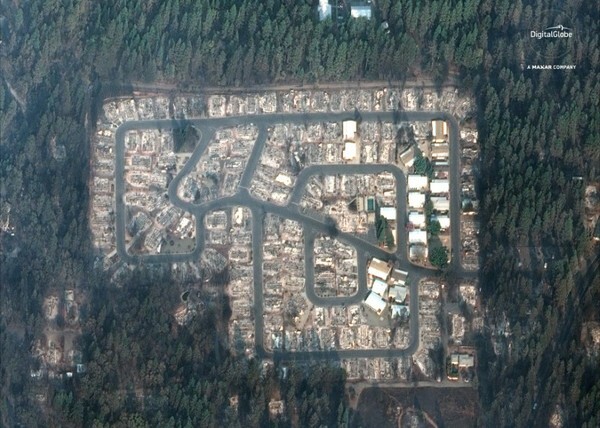 Camp Fire, showing the devastation of homes in the Kilcrease Circle community of Paradise. Note the surrounding green, mature forest with little or no scorching. The homes were not burned by a high-intensity crown fire, but were ignited by embers, followed by home-to-home ignitions. Photo: Digital Globe, a Maxar company via Reuters, 11/17/2018. The short version of the story is this: There are very few plants that are “fire safe”. Most plants have some woody structure, and wood burns. There is such a thing as fire safe landscaping. A fire resistant landscape approach will maintain a 100’ defensible space around homes by removing combustible materials and having hardscape features with high moisture/low flammability plants to limit potential fire fuels. Careful spacing with low-growing native, drought-tolerant plants is best to resist fire, although no plant is fireproof. Keep plants from creating a fire ladder up trees and select trees with low sap or resin (such as hardwoods like our lovely oaks) instead of highly flammable pines and eucalyptus. Images below explain defensible space standards. Lessons learned from the Thomas fire in the Ojai Valley: All plants can burn given the right conditions of excessive wind, heat, exposure, lack of rainfall etc. Oak trees that have have not been maintained and cleared of dead branches are more fire prone so the key is maintenance and placement. To protect your home, creating defensible space around your home is a must during fire season. There are many things you can do. Here is a list, not in order of priority. 1. Installing metals screens on vents to keep embers out. More info on installation of vents here. 2. Care should be taken to not place fire prone plants adjacent to any structures and preferably not within 30 feet of the house. Info on plants that are highly flammable and should be avoided is here. FIRE SAFE Landscapes and Plant LISTS See the attached lists from San Diego and Santa Barbara. 3. Remove highly flammable plants. Examples of include ornamental juniper, Italian cypress, Leyland cypress, rosemary, arborvitae, eucalyptus, and some ornamental grasses. Remove “high fire hazard” plants. I still see Mexican feather grass around town, with very dry clumps that spread easily into crack and crevices surviving on little to no water. More info on invasive qualities is HERE The slightest wind sends the delicate seeds heads into motion. It is very flammable and invasive. See CAL INVASIVE PLANTS COUNCIL and look for the high risk plants (unbelievable but true, some are still sold in nurseries). Up to 70% of water can evaporate from the soil on a hot day if you don’t have mulch as a protective layer on top. Mulch is one of the best moisture holding strategies you can employ. It prevents evaporation from the soil surface, helps suppress water-thieving weeds from growing and many mulches decompose to add vital nutrients to the soil at the same time. Avoid fine mulches that tend to clump and become water-repellent. Instead, use a coarser mulch which allows water/rain to move down through to the soil. A depth of 2-3″ in a garden bed is ideal. Apply mulch onto moist soil and water in well. During Santa Ana wind and fire season, understand the combustability of various types of mulch with composted wood chips the best. More info in this report, where various mulches were tested. 7. Install rain gardens and rain tanks to capture roof runoff. This will help saturate soils and provide extra moisture to develop healthy soils that act like a sponge to retain water in the landscape or in storage tanks.